Everyone has dreams, right? No, not the kind of dreams that you have when you're asleep, but rather the kind where you hope to do something in your life. It can be as simple as passing your next test, or as complicated as being the next Bill Gates. No matter what the dream, is there is always something that you have to give up in order to get closer to your goal. Ryo Hayakawa had given up on her dreams of going to high school long ago and was content with helping her mom in their family restaurant, the Shino Oden Bar. As her final year of middle school was drawing to a close, she had grown accustomed to being called in to help out the Wildcats, a local sandlot team, by pitching the final innings when they were in a tight spot. Little did Ryo know that her miraculous pitches would soon be seen by someone with their own dreams. During the celebration after a game, two men from a rival team show up at the bar and start causing trouble as they degrade Ryo's abilities. A visiting drunk recommends a test, for Ryo to prove herself by striking out the two men. She soon finds herself on the pitcher's mound pitching against the two lackluster loudmouths, when a true contender appears on the scene. He is Kisaragi Boy's High School's star hitter Hiroki Takasugi. He manages to get inside Ryo's mind and convinces her to throw him a fastball that he can connect without it fouling. He belts the ball right at Ryo, but she catches the ball in her glove and is blasted backward by the force. The three Wildcats onlookers and the drunken umpire rush over to Ryo to discover that she's managed to hold on to the ball. Hiroki is called out, and a moment of shock falls over him. He strolls over to Ryo and tries to help her up. She falls back down due to an injury to her ankle, so he grabs her and puts her on his back. Ryo struggles all the way home, but whether she likes it or not, she's just made herself a new boyfriend. All of this ends up being a test that was perpetuated by Mrs. Keiko Himuro and brought to fruition by the drunk, Mr. Kido. Ryo is soon called in for an interview at Kisaragi Girls' High School and given an enticing offer: a full scholarship to a very prestigious high school, on the condition that she plays baseball for the new girls baseball team and that the team makes it to Koshien, the national high school championships, in three years. The thing is, there's only one player on the team so far, and you need nine to make a team complete. So, it's now time to go and find the rest of the girls and get some type of training in. Let's just say, that's going to be a feat in and of itself. One thing that Princess Nine has is a large cast of characters, but it isn't hard to keep track of everyone. Keeping up with who's who is made easy by the inclusion of character stats during the episode breaks, and is further helped out by the unique pacing of the series. Early on, the show is all about building the team one person at a time. The story revolves around Ryo in the beginning, and branches out to include her rivalry with Izumi. Then, the other team members are added one or two at a time. So in a way, the viewer gets to know each of the unique personalities of the players slowly, and this helps to build up the tension of making Mrs. Himuro's dream come true. The movie line, "If you build it, they will come" might come to mind when watching this show, but it doesn't really hold the same ground that it used to. For instance, the players just don't show up... they have to be persuaded to join, and then you have to actively seek out those hard-to-find people that you want and make them see the light. To date, very few sports-based anime titles have been released in North America. 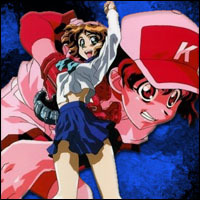 Pioneer released the hilarious Battle Athletes OVA and TV Series and U.S. Manga Corps released Ayane's High Kick, but each had their own downfalls. Battle Athletes was strictly a comedy series that dealt strongly in fan service while Ayane's lackluster plot made it a quickly forgettable title. Where Princess Nine succeeds is in the fact that the show actually has a set of strong and, at the same time, likeable female characters and a plot that compassionately portrays the struggle to overcome gender discrimination. In fact, the show performs this miracle through the use of baseball. Quite a feat indeed. Consisting of 26 episodes, Princess Nine premiered on Japanese television in 1998, and is just now making it's presence known in North America, thanks to it's release by ADV. The original dialogue for the series featured, at the time, some mostly unknown voices to the main characters while firmly giving the adult's voices to some well known seiyuu from such shows as Neon Genesis Evangelion and Fushigi Yuugi. The dub features a number of voice actors that will surely be familiar to fans of Nadesico, but don't expect over-the-top voice acting in this series. Well, at least not all of the time, because the show isn't meant to be a comedy. Though the show is stacked with a ton of characters, the main triangle of characters is surprisingly strong. Ryo is voiced by Hilary Haag, who gives a very tomboyish and never-say-die type of attitude to the role, yet at the same time leaving a bit of childish naiveté intact. Izumi is voiced by Monica Rial, who brings to her role a very standoffish quality that helps bring the rivalry over Hiroki that grows between Izumi and Ryo to a bitter head. Hiroki's voice is Vic Mignogna, and he brings a laid-back and playful quality to the character, especially in his use of the pet name he's given Ryo... "Miss Tofu." Princess Nine is currently being released by ADV exclusively on DVD, both dubbed and subbed. The first volume features five uncut episodes. One can expect volumes to follow every two months with four episodes each, and then the sixth and final volume will feature five episodes. Watch for it, because it's time to play ball. Izumi is the refined daughter of Keiko Himuro. 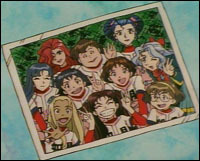 She is opposed the baseball team and the fact that Ryo has stolen Hiroki from her. She is a star tennis player, but she is a natural when it comes to any sport. This one-time Olympic hopeful quit the sports that she loved and started hanging around bars when her parents started their divorce proceedings. After being conned by Mr. Kido, Seira now guards second base and bats right-handed. Kido is the Kisaragi Girls' High School baseball team coach. He spends his nights drinking, and often misses his appointments. He hasn't coached since Hidehiko Hayakawa played, so he wants to prove that he still has what it takes. Original Material © 1999 / 2001 Animefringe, All Rights Reserved. To better serve our Latino readers, we now speak Latin!